Celebrate Earth Day with a fun art project made from recycled materials! We will create personalized animal-shaped pots featuring endangered species, complete with soil and a new plant to bring home. Ages 7+. All materials provided. $40/child. On the eve of Star Wars Day, we’ll be creating this exciting painting of everyone’s favorite rolling droid and the legendary ship from a galaxy far, far away! Join us for our Mother's Day workshop, where the students will be creating a beautiful acrylic painting for Mom...or with Mom. That's right, this special project is designed to also be a collaborative piece between mother and child. Spring is in the air and we’re celebrating Easter with funny bunny art! 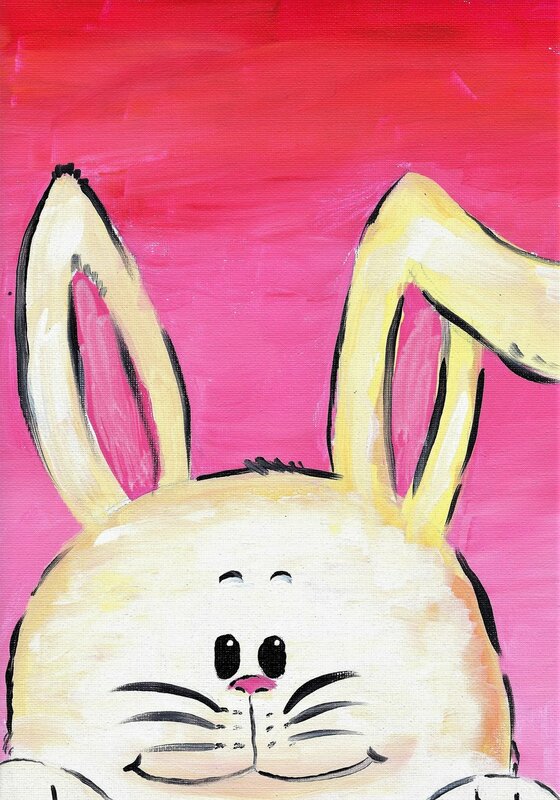 Not only will students paint a hoppy smiling bunny in acrylic, but they will sculpt a mischievous cottontail caught in the act! For our upcoming Fun Friday, we will embrace the rainy weather with this lovely acrylic on canvas. For our upcoming Magical Monday, we’ll be creating this striking piece in celebration of Valentine’s Day: two elephants with kissing trunks forming the shape of a heart. The acrylic on canvas makes a perfect gift for someone you love. Our wildly popular annual event returns! As always, we’ll provide all the materials, your child provides the creativity, and we’ll handle the mess! This time around, we’ll simulate Christmas Eve morning with the sights and sounds of the holidays. Don your PJs, enjoy some hot cocoa, and let’s build some gingerbread houses…and do our part to rebuild Butte County. All ages. Families welcome. Join us for our special Holiday workshop, where the students will be crafting the unmeltable snowman. The pieces will be constructed from actual, freshly-cut Christmas tree slices! While the paint dries, kids can make ornaments, coasters, or other keepsakes using the “wood cookies”. As part of ARTober at the Sacramento Children’s Museum we will be providing a free-sculpting session with red clay, courtesy of the Creative Arts & Music Center! Invent and create your own miniature sculptures and then paint your finished product! Be ready to bring your project home to dry and display it for all of your friends to see. It will be a great exercise for the mind and for those busy little fingers! Come join Jayden as we have fun with slime! After brief lesson in making your own slime, you can play with your slime, share or trade your slimes! Donations taken at the door to benefit Jayden's charity of choice: CHADD. For more about CHADD, click here. Enriching art experiences aren’t just for kids. We’re kicking off our Adult Art class on Tuesdays. Come on July 17th @ 6:00-7:30pm for our free open house. Take some time for yourself and explore your creative side. Join us for our Father's Day workshop, where the students will be creating a beautiful piece for Dad...or with Dad. This special project will feature a silhouette of the family member(s) layered over an abstract, acrylic background. Make memories while making art together. In celebration of Solo: A Star Wars Story, come join us as we recreate the legendary ship. Using Model Magic and acrylic, watch as your creation flies among the stars! Join us for our Mother's Day workshop, where the students will be creating a beautiful acrylic painting for Mom...or with Mom. That's right, this special project is designed to also be a collaborative piece between mother and child. All materials provided. Celebrate Earth Day with a fun art project made from recycled materials! 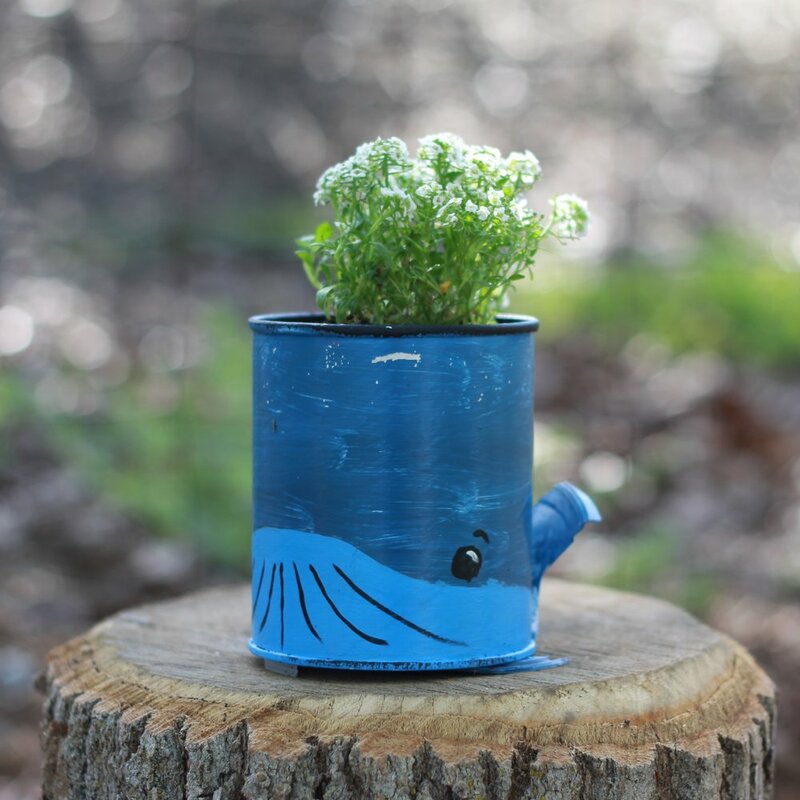 We will create a personalized animal-shaped pot, complete with soil and a new plant to bring home. Spots are limited. Please click the event image to make a reservation. SOAR with the Horizon Eagles is free, open to families (children must be accompanied by an adult at all times) and no registration is needed. Whether you’re a current Horizon Charter Schools family or have always wondered what it would be like to homeschool your kids, this event will give you a glimpse into some of the fun activities available to our students through our partnerships with local businesses. So bring your little eagles and watch them #SOARWithHorizon! Look for the CREATIVE ARTS & MUSIC CENTER BOOTH! In the spirit of St Patrick's Day, come build a trap with us to catch a pesky leprechaun! You'll assemble the tricky trap with a variety of materials and techniques. Join us for a FREE art workshop as students will create a collaborative, abstract piece. The final piece will be put up for auction at the Eureka School Foundation's 9th Annual Art Auction & Music Exhibition. Join us for our Valentine's Day workshop, where the students will be creating a beautiful acrylic painting, a lovely hand-crafted Valentine, and a special little surprise for Mom and Dad. Feast your eyes - not your sweet tooth - on these delectable gingerbread houses your little ones will create. FUN FRIDAYs make their return to the Center this week!! In celebration of Star Wars: The Last Jedi, come recreate the epic forest battle between Rey and Kylo in acrylic AND sculpt your own adorable Porg.